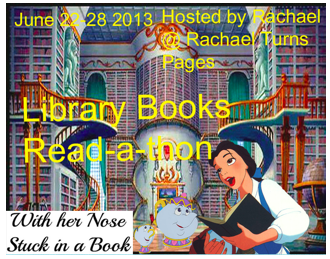 Book Dragon's lair: The Library Books only Read-aThon is coming! I'm very excited to announce my very first read-a-thon. I love read-a-thons and I really think they motivate me to read. I present to you the Library Books Read-A-Thon. June read-a-thons seem to be in short supply so I hoped to fill in the gap. The goal of this read-a-thon is to read as many library books as possible. If you are like me you always have books that are close to due that need to be done and fast so this read-a-thon is a great time to get those books done and get them back to the library. I'm not going to be picky. If you want to read your own books go ahead. I just love read-a-thons so I would love anybody who could join. This Read-A-Thon will start at midnight on June 21 and will go until midnight of the 28th. I will put an update, linky post up every day during the read-a-thon so you guys can link your progress and we can meet new bloggers through this read-a-thon. The Sign Up Linky is here. Please put the link directly to your sign up post. Grab the button and go. I have over 40 books on hold at the library! Most of these are "suspended". I have eight books checked out and unless there are hold requests, all have at least one more renewal. The Dwarves by Markus Heitz is "in transit" so is The Mystery Woman by Amanda Quick. Two where I'm next and one hasn't been published yet. I did a quick run through and un-suspended four books. . .
Wow that is a lot of books checked out from the library. I'm working on finishing an overdue book right now. Thank you for signing up for the read-a- thon. I'm excited about the turn out. Thanks again. Thanks for bringing the read-a-thon to my attention! I'm joining in too. Hope you enjoy Ready Player One--I read it earlier this year and really liked it.